As a traveler and adventure, I always wanted to try new things-to experience not just places, but also activities that not many people do. I go for the experiences that are beyond the usual. I make it a point that I get to experience something new-something that is not experienced by many. One example is "going local". I try to go local as much as possible and if I'm in a different country. By doing that, I get to experience things that can't be experienced everyday back home, and that makes my travel more meaningful. Those new experiences are what make my travel more meaningful. They say we only live once and life is short that's why we need to make the most out of it. So when my my friend Lauren of The Wandering Orange, also a passionate traveler and blogger, invited me to bungee jump on her birthday, I accepted the invitation. We went to Pattaya, a touristy coastal city an hour and a half away from Bangkok. We took the van in Victory Monument which cost 97 baht. We arrived in Pattaya on a Saturday afternoon. 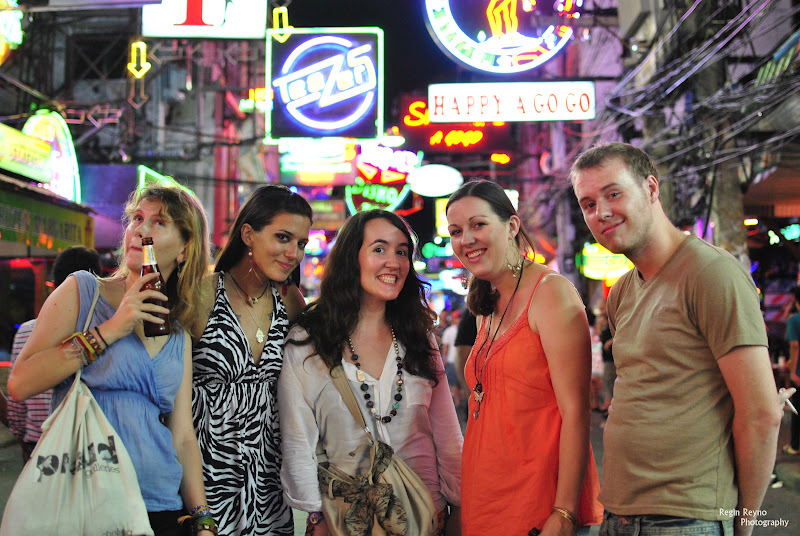 There we met some of her friends from her former school who went to Pattaya that weekend to celebrate her birthday. After checking in at Radi Mansion, we went into a Mexican restaurant called Tequila Reef to celebrate her birthday. That was one of the best Mexican Restaurants that I have been. The food was really delicious and I love the ambiance of the place. Good food with cool people, that night was so awesome! The next day, Sunday, was the day we've been waiting for. Time to bungee jump. Lauren booked our jump via the internet and the company's SUV picked us up from our hostel for free. Prior to that, while we were enjoying our breakfast at the hostel, many fearful thoughts came into my mind. I've read about bungee jumping in the internet and I am aware of the dangers and risks that go with it. So I was so nervous and anxious that morning. But that didn't hesitate me from pursuing my plan, as I really wanted to experience it and I know I can do it. As we drove to the bungee jumping site, we got more anxious. I couldn't stop from worrying. There were so many "what ifs" in my mind. What if the rope will break, what if they miscalculated the lenght of the rope, what if I'll get a myocardial infarction, or aneurysm due to increased blood pressure, what if my legs will be fractured, what if I'll have vertebral injury, what if I'll have retinal detachment, what if I'll have complications secondary to increase intra-cranial pressure. So many fears. I finally saw the crane. It is 50 meters high. Ironically when I saw it, I became more confident. I know my capabilities, and seeing that thing, I knew this is just another drop. The reason I became more confident is because I have been to countless theme parks around the world and I have tried their scariest rides and I know I can handle it. Lauren and then Cin jumped first, and then It was my turn. As they were preparing the ropes, I went to the toilet and knelt in prayer asking God for protection, as any mishap can cause my life. As they tied the rope to my legs, I still can't believe that I'll be doing it. They slowly lifted me up until we reach the top, with a height of 50 m. It was so high. And jumping from that point was just completely insane. I was scared to death. I thought this would be very easy but I was wrong. I wanted to go down but it's now too late. So just took deep breaths and prayed one more time. It took me like a few seconds before I jumped. I looked down and saw my friends there as small as ants already. It was a terrible feeling. It's like the end of your life. I hold on the rail tightly and I didn't want to let go. But I know I have no choice and I have to do this. So I just conquered my fear and then dropped. That feeling when you are dropped in some of the rides in theme parks was felt-It was the same feeling. After the first bounce, I gained composure and pretended to be flying. That was when I enjoyed it. It was really exhilarating and fun. The feeling of fear was all gone the moment I was in the air. After the jump, I realized that it's not so fearful after all. The only time when I got so scary was when I was about to jump, that's it. The rest was so much fun. 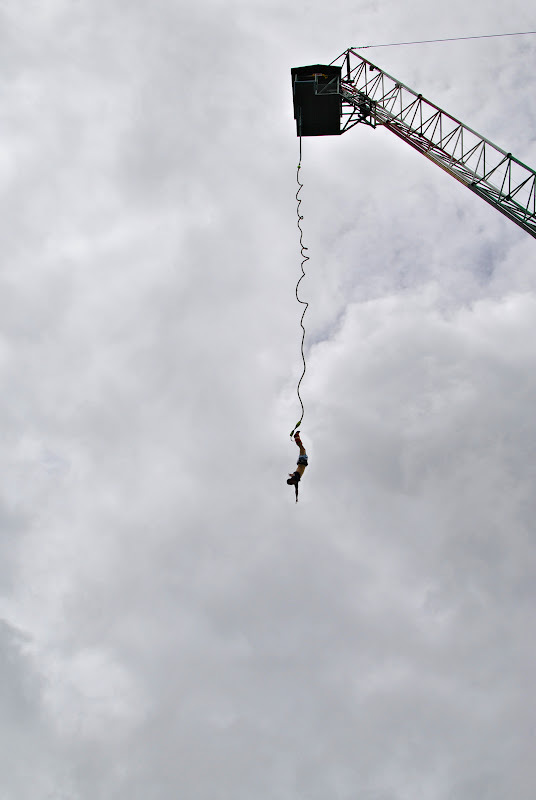 So finally, I was able to do bungee jumping, a feat I am so proud of. I had a sense of accomplishment, that just because not many people can do it, but because I was able to conquer my fear. That was one of the most fearful moments of my life, and yet I was able to muster up my courage in doing it. L-R: Cin (FRA), Lauren (USA) and I (PHI). We did it! I'd like to thank God for the protection and for the opportunity, and to Lauren for inviting me to do this. And for Cin, Rachel, Kate and Will for the wonderful company. I was so happy that I did it. I just experienced one of the most fearful moments in my life and I have conquered it. 1. Life is short, live your life to the fullest. 2. Sometimes, our fears are nonsense. And because of fear, our potentials are limited. 3. God sends His Holy angels for protection. 4. Our perception of things are more fearful than what it really is. 5. Friends are a blessing from God. from Bangkok you can take a bus in Mochit station (norther bus terminal) or a van in Victory Monument. What was the scariest, craziest thing that you did in your travels? Wooohoooooooo! You finally did it! Galing! Thank you. Ikaw na next. Yup, she's really an adventurous person. She's fun to be with too. Visit Thailand, and I'll bring you to this jumping site. Thanks for inviting me to do this. Let's do skydiving next time. awesome post..i have to try this! Thank you. Yup, you should, it's fun. O really? You should definitely go to Thailand and try this too. nice one do! will definitely try this one soon! Oo do. Sure. Sa January tirahin mo to. I am envy you BIG time!!!! wow, this is my dream! ang hirap naman basahin angs site ng Radi mansion. marunong kaya mag english ang staff nila? saka yung van sa victory monument, meron po kaya kahit 6am to pattaya? Yup, they can speak English there. The owner is a German. I'm not sure about the time of the last departure of vans in Victory Monument. Thanks for dropping by. loss mitigators it really is crucial to become patient and polite.
" First Romney responded by saying that they had vetoed a proposed boost towards the minimum wage while governor of Massachusetts payday loans apart from that, the borrower is maintaining a valid active bank account for at least 90 days old. If you deal having a car buying service that has become around for a few time, they're going to give you the respect you demand pay day loans in unsecured type of loans generally the total amount range offered by the lenders can be 1000 to 25000 while using repayment duration of 1-10 years. of funds inside the business each year.